There are so many elements to designing a stylish ensuite bathroom. It’s not just about deciding where to put your shower and what kind of tiles you want. You need to be able to see the finished result before you start, otherwise you may well end up with a bathroom that looks eclectic rather than stylishly defined. Here are our 6 tips for designing a stylish ensuite bathroom. There is no doubt that the colours you choose for your ensuite bathroom will have a huge impact on the look and feel. If you want to design a stylish ensuite, keep it simple when it comes to colours. Going with a monochrome look will create a feeling of space and cohesion, giving the bathroom a sleek finish. If using colour, use it throughout key elements of the bathroom to ensure it all ties together. Alternatively, use a single fixture to add a splash of colour or accessorise with colour, for example with a framed mirror, towels or vanity unit. The layout to any bathroom is crucial. To keep your ensuite feeling stylish, make sure the room flows well and space is used effectively. Also don’t forget to incorporate clever storage. Drawers are becoming much more popular than traditional cupboards and are also much easier to access. Tiling choices are seemingly endless but can make or break your bathroom. Many bathrooms across Australia just have tiling on the floor, in the shower and around vanity units, but to create a really stylish ensuite bathroom, consider floor to ceiling tiles. By using the same tiles for the floor and the walls, you’ll carry the look throughout the room and make your ensuite appear bigger – which is handy when you have a small bathroom. Don’t opt for bog standard lights in your ensuite – if you want a really stylish bathroom, find an unsual light fitting that is not only functional but looks beautiful as well. You could find light fittings that will blend into the bathroom seamlessly. Alternatively, if you want it to make it a feature, choose lighting that stands out. Want a Hollywood feel? Add lighting around your mirror. Going for a vintage look? Source vintage decanter bottle light fittings or an old French style chandelier. Want a splash of colour? Find a coloured light fitting to draw your attention to the ceiling. Once your bathroom is complete, use accessories to bring your ensuite to life. Soap and toothbrush holders, towels, bins and baskets can all add colour and texture to your new bathroom. You could even add some art to make the space not just functional but beautiful as well. 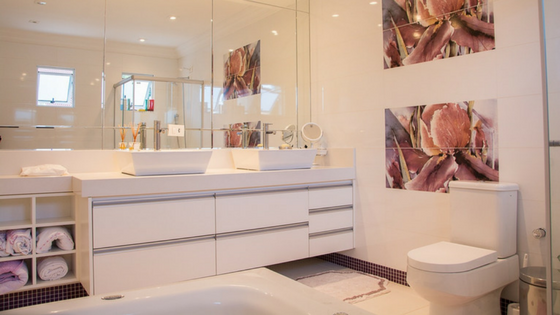 If you’re designing a stylish ensuite bathroom and want to make sure no detail is missed, leave it to the experts at Perth-Fection Plumbing. Our Perth plumbers can help you make the most of your bathroom space, and design a functional, yet stylish ensuite bathroom that you’ll love. Call our plumber in Perth on 0451 781 384 or contact us online and we’ll get back to you soon.